I'm gonna go for sub 10 tomorrow hehe. As much as I'd rather you didn't, but good luck! You should be all good if you've got the right cooling. I am sure he can get sub 10. If he knows what he's doing he'll be fine, and he can do what he wants. Just take the side panels off the case and all should be well. To nukejockey and everyone else, please put the url to your screenshot in your post. I don't mind you embedding the image but please also supply the url link. Saves me farting around trying to find it. Damnit! Heheheh. Nice work mate. I get major stability issues @ 4.7. Fairly certain it's the Northbridge that's stopping me and a voltage increase doesn't seem to help. Still running Firmware ver F1 on the mobo though, so might try F2. I already have two fans on my cooler, short of putting a Delta on it, i dont know what to do. Surprised you both aren't running water cooling yet. Not earth shattering, but sub 11 secs. 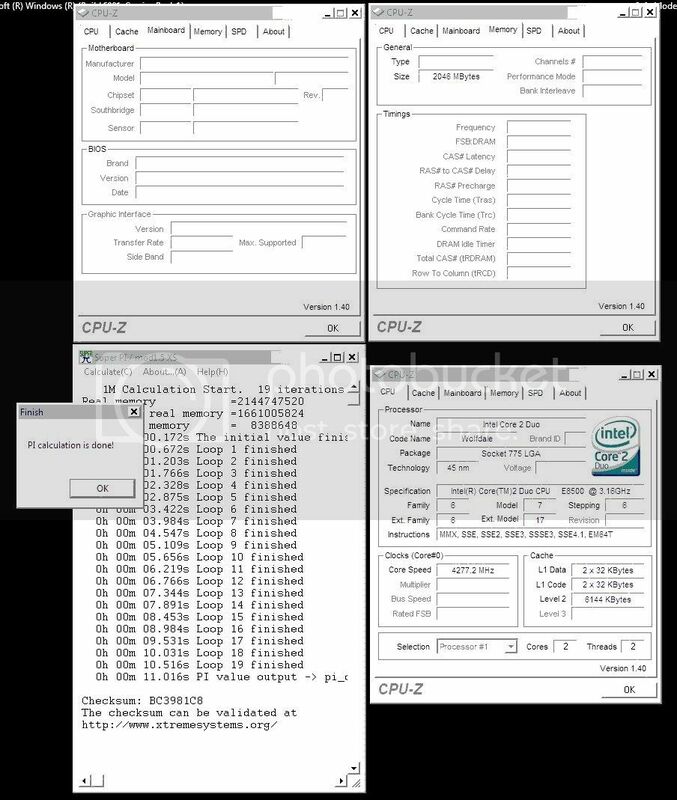 E8400 4.275GHz with TT Big Typhoon, nothing fancy. Crucial Ballistix 8500 (dual sided) 4-4-4-12 at 950MHz. Well done mate, however I need to see a CPU-Z window in your screenshot, so I can confirm CPU category and so everyone else can see you're speeds etc. 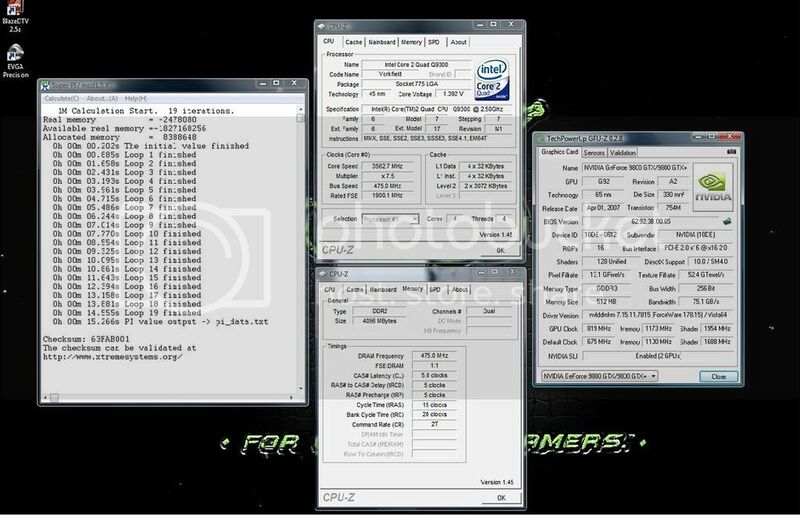 Q9650 at 4.195 GHz I got a score of 11.045 seconds or something of that area. just shy of the number 10 spot. but sorry. that will soon be passed. these chips are great and can overclock pretty well. and for those that said that Nvidia boards are no good. and I wont be able to clock a Quad very far on a eVGA 750i. Well heres a screeny of my SuperPI score for validation. and also showing a 466 FSB on this thing. I've done 4.2 Ghz and I'm going to try higher a little later. but I don't wanna give this thing to many volts. but it's a great chip thats for sure. I'm very much enjoying it so far.. oh and these are all on AIR with a Tuniq Tower only. these chips run cool. as I'm runnin around 39c at 4.2 Ghz. Here's the SuperPI score.. Good Idea Mark84, Here's my current results and there WILL be more to follow. I want that number 10 spot. or better. we'll see what this board can do. I'm sure I'm getting close to my limit though. will try for better score l8r. new pi score 15.266 not a huge improvement but im still learning. Maybe have a look at tightening the RAM timings too if you can, will help get a better score. mate do you have your ram linked or unlinked? because i tryed to tighten the timing to 4-4-4-13 on 4g dominators and it wont post. linked i can get it to 5-5-5-15 unlinked at 1066 i can only post at 5-5-5-18. I think it's linked, though I haven't tested it much past 420MHz ish. Set RAM voltage to 2.1v and you should be able to get 4-4-4-13 at least to around 425MHz. Not sure if it'll work all the way up to the 475MHz you're needing though, I haven't gone that far with 'em yet. ive tryed all sorts of combos linked, unlinked, lowering the fsb to no avail. everytime i try any combo with 4 no post. ive got it at the moment 5-5-5-13 with 2.2v. seems thats the best im getting it.